Foot comfort can make or break your day; if your feet are miserable, usually you are too. Whether they are for the jobsite, recreation or both, choosing the right boots has a strong impact on your overall comfort. There are many aspects to consider from the sole and uppers the inside and outside of the boots. The material of boot uppers play a large part in protecting you. The kind of jobsite or recreation you be doing needs to be considered when choosing boot material. What will the conditions be? Do you need waterproof boots in case of standing water, rain or snow, or working near moving water? Common types of material are treated leather and nylon or polyurethane and rubber are common for rain or processing boots. The uppers should also provide support in addition to providing protection from the elements. Temperature isn’t the only factor to consider when choosing the amount of insulation you need. Your activity level needs to be considered as well. If you are sitting, while driving machinery or ice fishing, you likely need more insulation because you aren’t generating body heat. But if you are on your feet all day, you’ll build up heat in your shoes as you move and too much insulation will cause you to sweat and make you uncomfortable. You can also consider whether the boot material is breathable to allow perspiration to evaporate. Slip resistance is key in cold temperatures when the ground can easily get slick. Don’t just look at slip resistance, however; see if the material is made for cold temperatures. Often slip resistance ratings are only for normal temperatures, and the material of the sole will become hardened and eventually crack once the temperature drops. If you are hiking through snow or on ice, or working on frozen soil or concrete, you need to be sure the outersole will stand up to the cold and keep you from slipping. 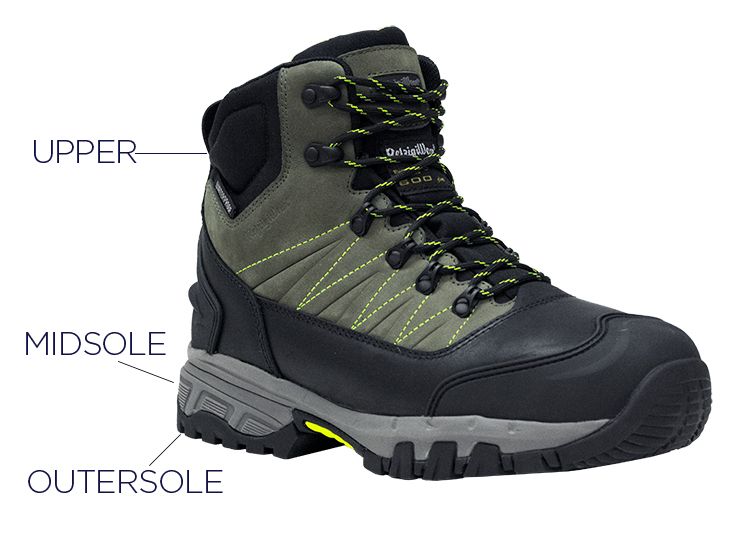 The outersole is also what protects you from other hazards, like electric shock. Make sure the boot is rated for shock protection if you have a risk of encountering live electricity on the jobsite. Ankle support improves stability and helps reduce fatigue – important if you are on your feet all or most of the day. A higher boot provides more support, as do padded ankle collars. Snug fit is also important. When choosing a boot for work, or for a high impact activity, you want to make sure that the toe is adequately protected. This usually means reinforced steel or composite. When available, composite is a better choice as it reduces cold transfer and is lighter than steel. There are many other features that can be included in footwear that might sway your decision to one over another. Kicking shoes off from the back can break the heel, unless a kick plate is built in specifically for the boots to be kicked off. Do you prefer laces, slip-ons, or zipper closure boots? There are pros and cons to each, such as a secure and snug fit, limited area for snags or contamination, and more. Added comfort can come from padded linings – see if your boot comes with one built in or if one can easily be added. The insole should have wicking properties to pull moisture away from your feet and keep you dry. How heavy the boot is impacts fatigue if you are on your feet all day. Boots that are too tight can lead to blisters, corns and in-grown toe nails, not to mention overall foot ache. You need a snug fit but not one that is too tight, especially in the toes. While some leather boots will stretch a little to conform to your foot, a composite or steel-toed boot will not. So make sure to find the right size and if it feels even a little tight, don’t’ be afraid to move to a wide size or a half size up.